911 Security comply with current industry legislation in the Republic of Ireland. We are NSAI certified and hold a current PSA licence. 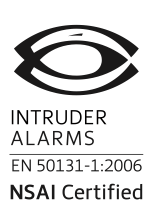 We undertake our own quality checks through our Contracts & Operations Management.All of our intruder alarm products and services conform to the E.N. 50131-1 Standard and the company holds a current PSA licence, while our full range of products and services meet the very highest international standards. Our commitment to excellence extends to a 24-hour emergency service, with fully trained staff on call 365 days a year with on-site, telephone and email support.